A Guide to the Treatment and Prevention of Tennis Elbow! Tennis Elbow is currently one of the most diagnosed conditions in the western world. It is extremely common, and can be excruciatingly painful. There are a number of conditions that effect the elbow area. The three most common conditions are "lateral epicondylitis" (tennis elbow), "medial epicondylitis" (golfers elbow), and medial collateral ligament sprain (throwers elbow). The first two conditions are very similar, however the first effects the outside of the elbow (lateral), and the second effects the inside of the elbow (medial). For the purpose of this newsletter we'll stick with the treatment of lateral epicondylitis, or as it is more commonly known, tennis elbow. Before we can understand just what tennis elbow is, it's important to have a general understanding of the structure of the elbow joint, and how the muscles, tendons, ligaments and bones help the elbow joint to function. 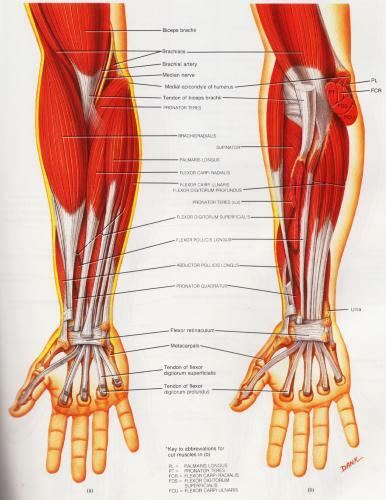 As you can see from the diagram to the right, there are many muscles and tendons that make up the elbow joint and forearm. The diagram shows the anterior (or front) view of the forearm. 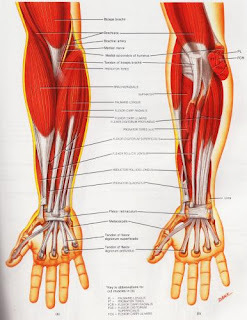 The left picture shows the muscles and tendons closest to the surface of the skin, while the picture on the right shows some of the muscles and tendons deeper within the forearm. There are also three bones which make up the elbow joint. They are the "Humerus," the "Ulna" and the "Radius." Now that we can see how the elbow functions, lets look at what exactly tennis elbow is. Tennis elbow occurs when their is damage to the muscles, tendons and ligaments around the elbow joint and forearm. Small tears, called micro tears, form in the tendons and muscles which control the movement of the forearm. They cause a restriction of movement, inflammation and pain. These micro tears eventually lead to the formation of scar tissue and calcium deposits. If untreated, this scar tissue and calcium deposits can put so much pressure on the muscles and nerves that they can cut off the blood flow and pinch the nerves responsible for controlling the muscles in the forearm. By far the most common cause of tennis elbow is overuse. Any action which places a repetitive and prolonged strain on the forearm muscles, coupled with inadequate rest, will tend to strain and overwork those muscles. There are also many other causes, like a direct injury, such as a bump or fall onto the elbow. Poor technique will contribute to the condition, such as using ill-fitted equipment, like tennis racquets, golf clubs, work tools, etc. While poor levels of general fitness and conditioning will also contribute. Pain is the most common and obvious symptom associated with tennis elbow. Pain is most often experienced on the outside of the upper forearm, but can also be experienced anywhere from the elbow joint to the wrist. Weakness, stiffness and a general restriction of movement are also quite common in sufferers of tennis elbow. Even tingling and numbness can be experienced. There are a number of preventative techniques which will help to prevent tennis elbow, including bracing and strapping, modifying equipment, taking extended rests and even learning new routines for repetitive activities. However, there are three preventative measures that I feel are far more important, and effective, than any of these. Firstly, a thorough and correct warm up will help to prepare the muscles and tendons for any activity to come. Without a proper warm up the muscles and tendons will be tight and stiff. There will be limited blood flow to the forearm area, which will result in a lack of oxygen and nutrients for the muscles. This is a sure-fire recipe for a muscle or tendon injury. Before any activity be sure to thoroughly warm up all the muscles and tendons which will be used during your sport or activity. Click here for a detailed explanation of how, why and when to perform your warm up. Secondly, flexible muscles and tendons are extremely important in the prevention of most strain or sprain injuries. When muscles and tendons are flexible and supple, they are able to move and perform without being over stretched. If however, your muscles and tendons are tight and stiff, it is quite easy for those muscles and tendons to be pushed beyond their natural range of movement. 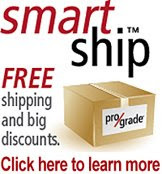 When this happens strains, sprains, and pulled muscles occur. To keep your muscles and tendons flexible and supple, it is important to undertake a structured stretching routine. For an easy-to-use, quick reference guide of 135 clear photographs of every possible stretching exercise, for every major muscle group in your body, get a copy of The Stretching Handbook. You'll also learn the benefits of flexibility; the rules for safe stretching; and how to stretch properly. Click here to learn more about The Stretching Handbook. And thirdly, strengthening and conditioning the muscles of the forearm and wrist will also help to prevent tennis elbow. There are a number of specific strengthening exercises you can do for these muscles, but instead of me going into the details here, I have simply found another web site that has already done all the hard work. It explains a number of exercises you can do, both with, and without weights, and also includes diagrams and comprehensive explanations of each exercise. You can find these strengthening exercises by going to http://www.physsportsmed.com/issues/1996/05_96/nirscpa.htm. Tennis elbow is a soft tissue injury of the muscles and tendons around the elbow joint, and therefore should be treated like any other soft tissue injury. Immediately following an injury, or at the onset of pain, the R.I.C.E.R. regime should be employed. This involves Rest, Ice, Compression, Elevation, and Referral to an appropriate professional for an accurate diagnosis. It is critical that the R.I.C.E.R. regime be implemented for at least the first 48 to 72 hours. Doing this will give you the best possible chance of a complete and full recovery. The next phase of treatment (after the first 48 to 72 hours) involves a number of physiotherapy techniques. The application of heat and massage is one of the most effective treatments for removing scar tissue and speeding up the healing process of the muscles and tendons. Once most of the pain has been reduced, it is time to move onto the rehabilitation phase of your treatment. The main aim of this phase it to regain the strength, power, endurance and flexibility of the muscle and tendons that have been injured.